I first saw the Buggaloop HEXBUG game at Toy Fair NY in February at the Ravensburger booth. I knew then that I'd like to write about it and so I was eager to see if it was as good as it looked on display when I received a sample to review. I held onto the game for when I knew we would have a long enough visit with my grandson to try it out. And so this week during Spring break out it came. And enjoy it we did. 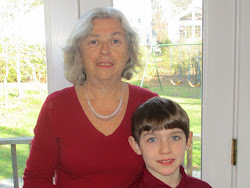 Zach, who is 6 years old, loves games and HEXBUG so it was promising. Turns out its a winner! Pop (that’s my husband) and Zach easily set the game up and it looked cool even before they started. 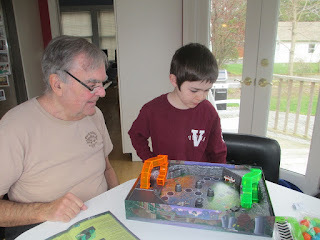 The rules are easy and there is a lot of excitement as you try to get across the board without being sent back to start because the HEXBUG has moved your piece off the path. You try, but sometimes fail to land on a “safe (elevated) space as you work your way across the board. 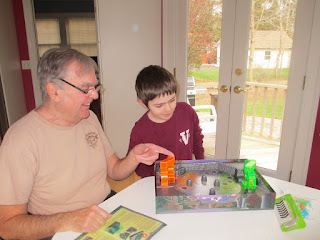 The game comes with a HEXBUG nano V2 and you fire it up, and he makes his way in no particular pattern around the board, knocking the pieces in play all around and then….when you least expect it… he goes into the green or orange clear tunnel and then the players can take turns trying to move their pieces along the board. 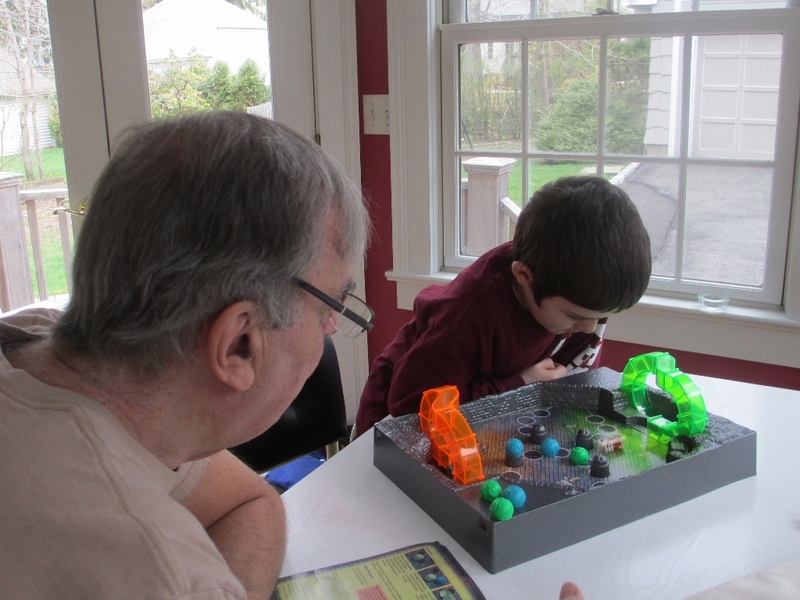 When he emerges, you have to stop the movement and watch him wander around the board causing chaos. Have you ever met someone who isn’t mesmerized watching HEXBUGS? 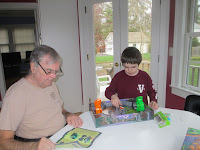 Pop and Zach really enjoyed playing it and I enjoyed watching them and snapping pictures. My husband said I should be sure to let you know that this game really is fun. He enjoyed it too. 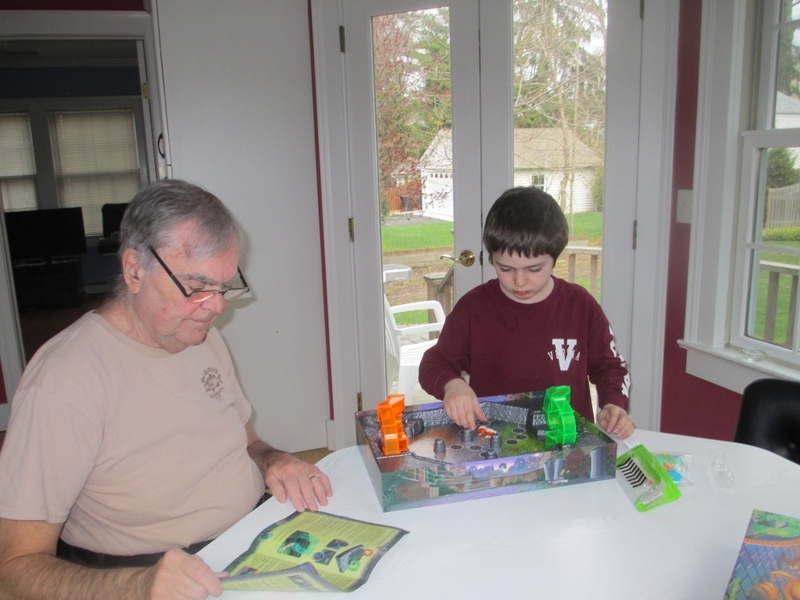 To quote the comment he left at my facebook post, "It is really a good thing for a grandparent to play with a child. It's easy, silly, and you don't have to get on the floor." Perfect grandparent criteria. 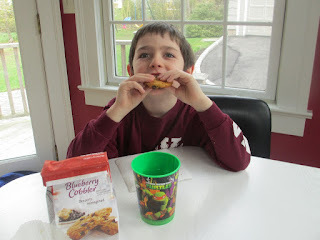 After an exciting game of Buggaloop you are ready for cookies and milk. Buggaloop is made by Ravensburger which is known for their high quality puzzles. This game is also a quality product. Made in the Czech Republic. It is available at ToysRUs and online at Amazon. 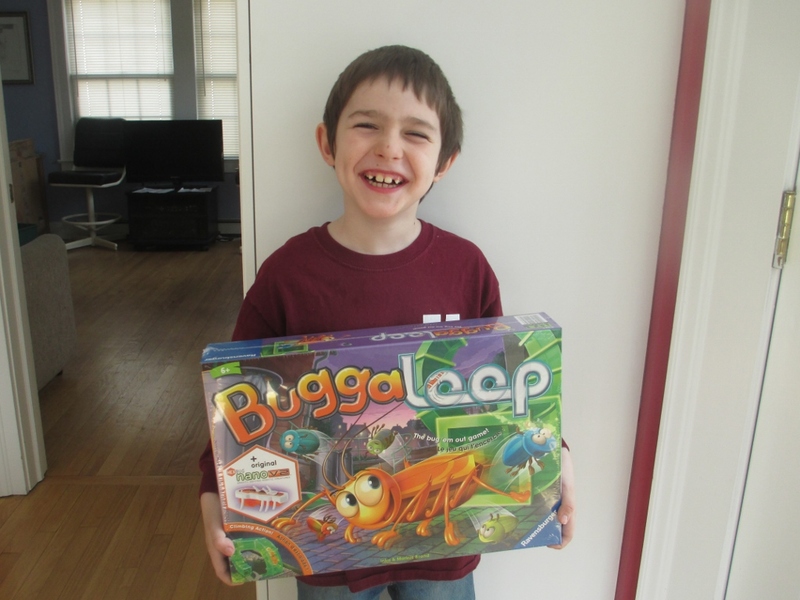 Full Disclosure: I received a free Buggaloop game in order to conduct a product review. The opinion expressed in this article is my own opinion and I have not been paid to write about it. I think my grandchildren would love this game. Thanks for the Christmas idea!